Worker lays down concrete outside of Callahan Hall. At the request of the Student Government Association, construction has begun on a sidewalk at the front of Callahan Hall extending from the B wing entrance, past the bus stop, and down to the front drive of the residence hall. After the area was deemed a potential safety hazard at both the Fall 2012 and Spring 2013campus safety walks, SGA successfully passed a resolution in April 2013 allowing for a sidewalk to be constructed. Sophomore Senator Kristian Johnson, an accounting and finance major and SGA’s University Improvements Chair, was a coordinator of the Spring 2013 campus safety walk and immediately noticed problems with the lawn area in front of the residence hall. Assistant Vice President of Facilities Larry Blake agreed with SGA’s conclusion and believes something could have been done sooner. “We went over and looked at it and they were right, it was a mess,” Blake said. 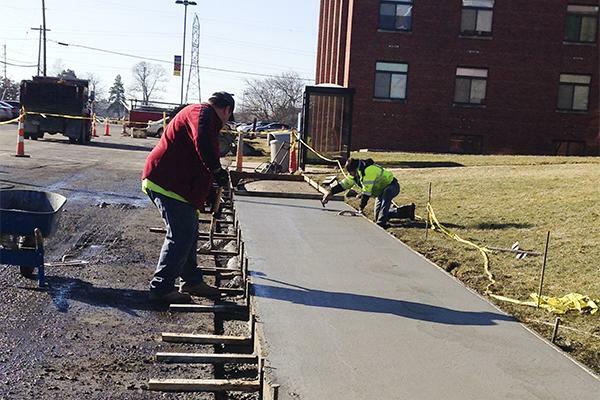 Crews have nearly completed construction on the part of the sidewalk closest to main entrance and as the weather warms, concrete will be poured on section closest to the B wing. Blake explained that although SGA only requested a sidewalk from the B wing to the bus stop, construction crews were instructed to continue the pavement all the way over to Callahan’s main entrance. “The sidewalk will cover the whole length of the parking lot,” Blake said. He expects the sidewalk to be finished within one to two weeks. Johnson is excited to see the resolution put into action. Not all of the residents of Callahan Hall have been thrilled with all of the construction taking place, however. Sophomore Nicole Griffith, a resident of Callahan Hall, said, “I just think it’s annoying. Personally I don’t feel we need a sidewalk.” She added that because she lives in the A wing at the front of the residence hall, the construction sometimes wakes her up. The construction has also caused the majority of the parking spaces located directly in front of the building to be blocked off by traffic cones and caution tape, forcing many students to park in Callahan Hall’s lower lot. Additionally, a new sign has been placed in the parking lot near the senior center and future Northern Terrace residence hall warning students not to park in that area despite its close proximity to Callahan Hall. Tickets will be issued to students who choose to park in that particular lot. Housing Director Arnie Slaughter stressed respect and patience as the construction is completed. The sidewalk construction is part of a larger plan for Callahan Hall. As construction on Northern Terrace is completed, the area between Callahan Hall and the new residence hall will be completely transformed. Blake explained that the handicap, reserved and all other parking spots located by Callahan Hall’s carport and community garden will be gone after this semester. In its place, a small plaza and turn around area will be constructed to connect the two residence halls. Blake revealed that the new plaza will contain outdoor seating, lighting, and landscaping for students. Handicap and reserved spaces will be relocated to the front of Callahan Hall in front of the new sidewalk. Slaughter feels that the new plaza will generate a sense of community between the two halls. “It will create more of a student-friendly college feel as opposed to two separate buildings that have no connection,” Slaughter said. Construction between Callahan Hall and Northern Terrace will be completed in August 2014.